The Tycoon Towers slot machine performs well in some areas, but in others it is slightly off the mark. At least when it comes to what we’d like to, and expect to find in a top video slot. Tycoons Tower is Rival Gaming’s latest big-money video slot. The Tycoon Towers slot is all about the good life. The slot is themed on a vastly overpriced hotel, where only big spending revellers will decide to stay. Rival have given the slot a massive 50 paylines, and you can choose to play with as many of these as you see fit, all the while trying to land a non-progressive jackpot worth 600x your total bet. But, what else can we tell you about the game in our Tycoon Towers slot review? 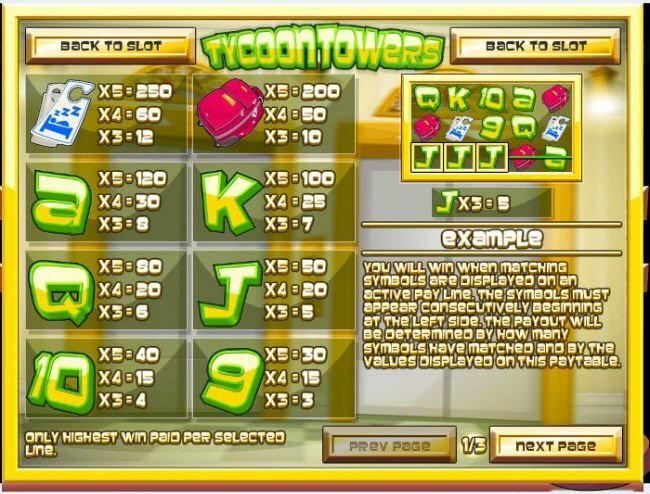 Players will notice that the Tycoon Towers slot graphics aren’t exactly of the highest quality. These cartoonish style symbols are satisfactory at best. Between the high playing cards, credit cards, luggage, bellboy, maid, and other hotel themed icons, you can win anything from 3x up to 600x your total bet. At the bottom of the reels, players will be able to adjust their coin sizes from 1p up to £1. 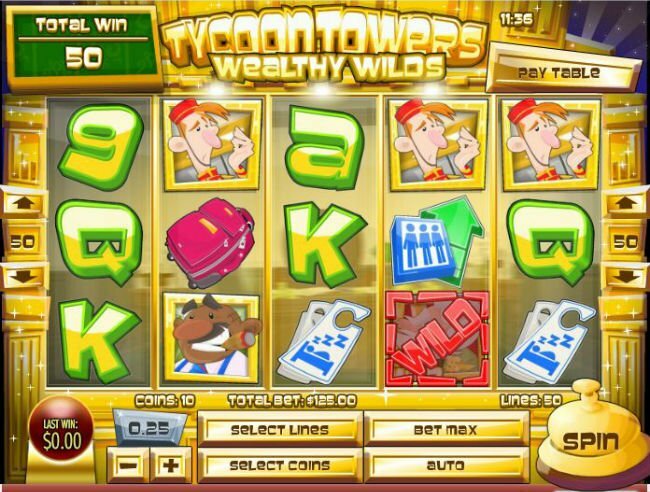 The Tycoon Towers slot machine will also permit players to stake up to 10 coins per line. Given that all of the Tycoon Towers video slot’s pay lines are adjustable, you are going to be wagering anything from 1p per line, per spin, up to £125 per spin on this slot. The old man (no doubt the hotel’s owner) is the primary special icon in this game. One of the main Tycoon Towers slot bonuses is the sticky wild feature. As a wild symbol, the old man is capable of replacing all other symbols in the game to form winning combinations. Wilds are also sticky, and will remain on the screen whilst triggered re-spins. As long as you keep pocketing sticky wilds, you will keep earning free re-spins. In this manner, you could potentially spin the reels infinitely for free – as long as you keep bagging those wilds. Rather comically, this is the only special feature to appear in the Tycoon Towers slot game. Rival's new release has it issues, but Tycoon Towers provides solid play for gamers. Not that you could really call it a bonus round, but the Tycoon Towers slot machine game’s primary bonus feature is the one we have already mentioned. Yes, the game uses its sticky wild re-spin feature as its special round. In all honesty, though, you and I both know that the re-spin sticky wild feature is exactly that, a special feature not a bonus round. Inevitably then, Tycoon Towers is without a bonus round. However you wish to cut it, there are some drawbacks concerning Rival's Tycoon Towers slot. The lack of a real bonus round is troubling, and there are no scatter icons for you to pocket wins with. Whilst it is certainly good that wilds are fairly profitable, and the pay-outs are reasonable, the aforementioned problem may be too much for some players to accept. The Tycoon Towers slot machine performs well in some areas, but in others it is slightly off the mark. At least when it comes to what we’d like to, and expect to find in a top video slot. Who Ya Gonna Call? Ghostbusters Slot!